"Your eyes… they've seen things. Who are you…?" Netflix has unveiled the official trailer for Gareth Evans' new film Apostle, his follow-up and latest film since making The Raid and The Raid 2, and the V/H/S/2 segment. Apostle is set to premiere at Fantastic Fest, then the Sitges Film Festival over the next month before arriving on Netflix. Set in 1905, the film is about a man who travels to a remote island to rescue his sister after she’s kidnapped by a mysterious religious cult demanding a ransom for her safe return. It soon becomes clear that the cult will rue the day it baited this man, as he digs deeper and deeper into the secrets and lies upon which the commune is built. Starring Dan Stevens, Lucy Boynton, Mark Lewis Jones, Michael Sheen, Kristine Froseth, Bill Milner, Elen Rhys, and Annes Elwy. This looks super creepy and twisted, extra intense and ultra violent, oh man watch out. I'm in, but nervous already about seeing this. Thomas Richardson arrives incognito on Erisden Island with the intention of saving his sister from the mysterious cult that kidnapped her. There, he’ll find a society that lives according to its own rules, and has a dark sevret. After revolutionizing action movies with The Raid, Gareth Evans turns his eyes to the early 20th century United Kingdom. 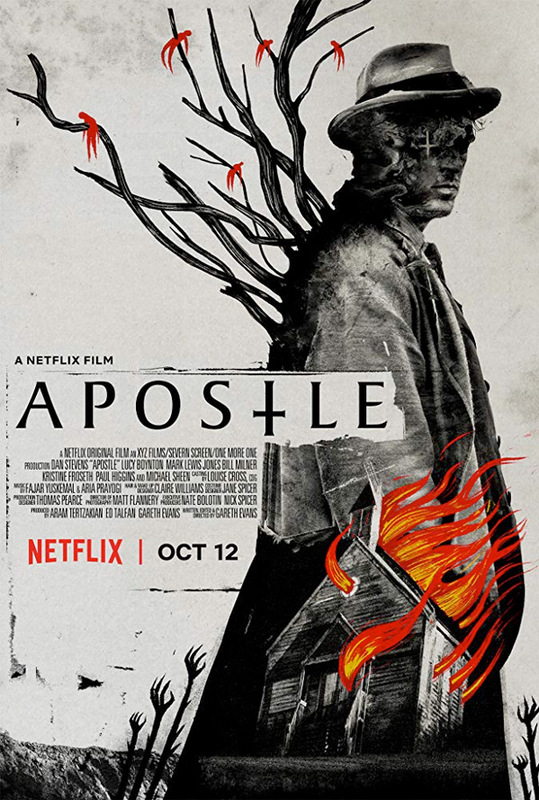 Apostle is both written and directed by Welsh filmmaker Gareth Evans, director of the films Footsteps, Merantau, The Raid: Redemption, and The Raid 2 previously. The film will first premiere at Fantastic Fest and the Sitges Film Festival coming up soon. Netflix will then release Evans' Apostle streaming exclusively starting October 12th this fall. First impression? Who wants to watch this?